作者: The AsiaN Editor on 7 September , 2018. President Moon Jae-in’s delegation to Pyongyang returned Wednesday after a fruitful meeting with North Korea leader Kim Jong-un. Presidential envoy Chung Eui-yong, Moon’s national security adviser, gave a press conference the following day to unveil the outcome of his visit to Pyongyang. 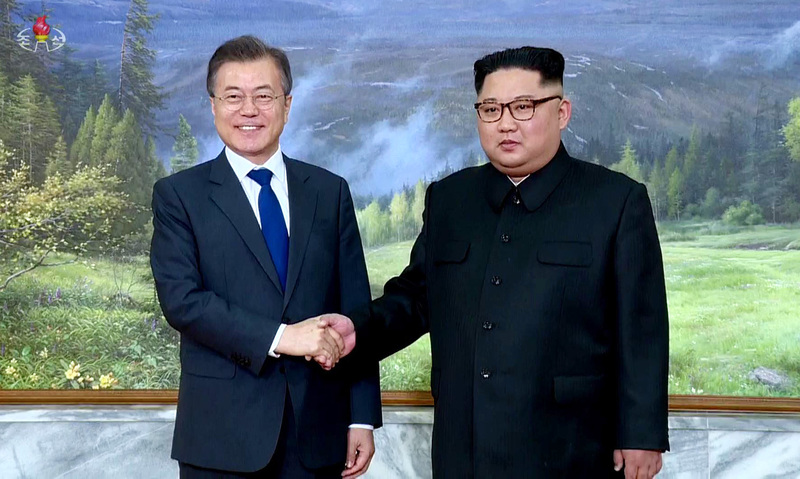 Before the delegation left for the North, it was unsure whether Kim would receive Moon’s envoys. Kim did not meet with U.S. Secretary Mike Pompeo during his latest visit to Pyongyang in July. But judging from the photos and videos released to the media, Moon’s delegation’s meeting with Kim seemed to have gone smoothly. In one of the photos, Chung was seen whispering something to a smiling Kim, showing the rapport established between them. The envoy’s trip was useful in that it served as a timely occasion to reaffirm Kim’s commitment to abandoning his nuclear and missile development amid stalled denuclearization talks. U.S. President Donald Trump cancelled a planned trip by Pompeo last month due to the deadlock in negotiations. Concerns have been mounting in recent weeks that bilateral relations may return to the way they were before the June 12 Trump-Kim summit in Singapore. Against such a backdrop, it is particularly noteworthy that Kim mentioned a timeframe for denuclearization. “Kim expressed his position that he is seeking to realize denuclearization within Trump’s first term while ending the 70 years of hostilities and improving U.S.-North Korea relations,” Chung said during a press conference at Cheong Wa Dae Thursday morning. Trump’s term ends in January 2021. Chung also conveyed to the media Kim’s “strong determination” to carry out more active measures for denuclearization and his commitment to working together with the U.S. According to Chung, Kim also urged the international community to recognize previous steps it has taken for denuclearization, such as the dismantlement of the nuclear test site in Punggye-ri. The delegation also finalized the date of the third Moon-Kim summit in Pyongyang from Sept. 18 to 20. High-level talks to discuss more details on the summit arrangements will begin next week at the border village of Panmunjeom. Cheong Wa Dae is expected to convey the results of the envoy’s trip to the U.S. and pursue a declaration to end the 1950-53 Korean War within this year as stated in the Pangmunjeom Declaration, the outcome of the first Moon-Kim summit in April. For the next inter-Korean summit to be a success, Pyongyang should expedite specific measures for denuclearization. What is marketization and when did it begin in North Korea? : Is North Korea a ‘communist state’ or a ‘market economy’?